Stamp-size satellites, developed at Cornell University, are getting a test run aboard the International Space Station. LOGAN, Utah — There is big news on the small satellite front. From super-secret agencies and the U.S. military to academia and private firms, as well as world space agencies and NASA, ultra-small satellites are the big thing. In sizing up "smallsats," there are a range of classifications in the less-than-500- kilogram department, be they minisatellites, microsatellites, nanosatellites, picosatellites, palm-size CubeSats, even the diminutive Femto satellite, weighing in at less than 100 grams. 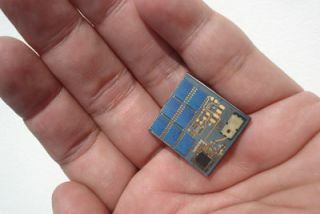 Cornell University has begun to delve into a postage stamp-size "satellite on a chip" design, called Sprite, envisioning a swarm of these tiny probes exploring planetary atmospheres for organic compounds. Call them a powerful force in the universe. Smallsats have already shown their ability to monitor disasters, study Earth’s environment and support agriculture, cartography and earth science missions. Drexel University Space Systems Lab students Kenneth Mallory and Swati Maini showcase their smallsat at last month’s Small Satellite Conference in Logan, Utah. Smallsats are part of the solution — when they used to be a distraction, said Matt Bille, an associate with Booz Allen Hamilton in Colorado Springs, Colo. So, what does this foretell? "The knowledge of how to make and use smallsats has passed the tipping point," Bille told SPACE.com. "It exists worldwide and has fostered a global generation of satellite builders and engineers. It used to be only a few organizations could build a satellite. Now, a smart teenager with a CubeSat kit and a soldering iron is a space agency. We’ve only begun to grasp the implications of that." "What this means for the future is that use of smallsats and satellites in general will only increase. The proliferation of smallsat capabilities has unleashed the most powerful force in the universe — human creativity," Bille said. CubeSats, tiny satellites launched as secondary payloads on rockets, offer big capability in small packages. Looking back over thelast few decades and gazing forward was Siegfried Janson, a senior scientist at The Aerospace Corp. in Los Angeles. Janson flagged the onslaught of advances in micro- and nanoelectronics, microelectromechanical (MEM) systems, solar cell technologies, global positioning systems, and the Internet itself. Toss in for good measure personal computers, he said, stuffed with multiple processors, graphic cards, pepped up with more and more memory. All that low-cost high tech has allowed small teams to blueprint, build and fly progressively smaller satellites with ever-increasing capacity, Janson told the audience. Janson anticipates that there will be a wider diversity of missions by highly capable small satellites, like formation flying to create large but virtual antenna sizes to make possible enhanced imaging from space. "Advancement of the technologies is no longer the primary issue," said Pat Patterson, chairman of the smallsat conference and director of the strategic and military space division at Utah State University’s Space Dynamics Laboratory. "It’s still the mission that matters. It has to give the customer some value," he told SPACE.com. "It’s kind of all coming together," Patterson said, pointing to smallsat attitude- control devices, batteries and solar cells, new ways to beat the heat and cold of space, coupled with smaller, lower-costing launchers. Collaboration is the key, said Doug Sinclair, owner of Sinclair Interplanetary in Toronto, Canada. He advised that universities building CubeSats need to focus on what they do best and rely on other groups to supply other resources. "For instance, exchange a radio for a computer. Both groups end up with a CubeSat, but now they’ve got much better odds of succeeding," Sinclair said. As for what’s the future of smallsats, there will be growth, new missions, and new ways of working together, said Bille,expressing his own views and not speaking for Booz Allen Hamilton policy. "CubeSats are like the personal computer of this industry." Hunsaker’s personal crystal ball predicts networked satellites with individual IP addresses controlled through the Internet and providing individualized positioning, communications, social and multimedia capability. "Perhaps just like personal computing and cell phones that have common utility among individual consumers today, smallsats will also follow that trend," said colleague Tom Hunsaker, also an associate at Booz Allen Hamilton.